Eagles in the News! Front Page Articles! K-8 Announcement! COTTONWOOD – Verde Christian Academy has decided to take a page from Cottonwood-Oak Creek’s playbook. For each of the next three school years, Cottonwood’s Christian school will add a grade to its pre-K to 5 population until it is a K-8 school, according to school administrator Ben Russell. “It is the time where we question who we are and who we want to become,” he said. Russel said that “several factors” over the past few years inspired the school that it could expand its curriculum to include middle schoolers. 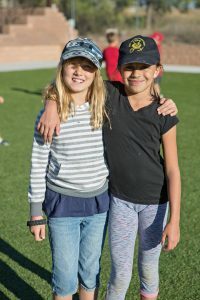 For the 2019-2020 school year, Verde Christian will add a sixth grade class, followed by a seventh grade class in 2020-2021 and an eighth grade class the following year. “They are excited to help us pilot our expansion,” Russel said. Verde Christian Academy is located at 102 S. Willard St. in Cottonwood. For more information, call 928-634-8113. Eagles in the News! Front Page Articles! 5 Star Quality First Preschool!